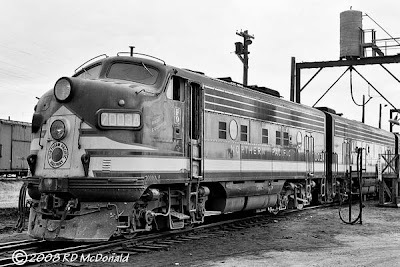 Oil-Electric: Northern Pacific 7003A - A Variegated History! Northern Pacific Railway 7003A. Auburn Washington, August 14, 1960. 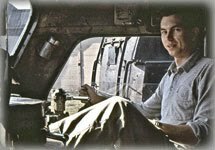 As a young man all of 17, I had acquired my driver’s license, and by meeting certain expectations, earned the right to use the family car once in a while, on my own! We lived just off Ambaum, over near Burien, so it wasn’t that far to hustle down to Auburn to check things out! Engine crews were thrilled with the arrival of the F-9’s. Northern Pacific ordered a total of 15 A-B-B-A sets, delivered between 1954 and 1956. Units were numbered “A” “B” “C” and “D”. There was a significant increase in performance over the FT’s, with horsepower increased from 1,350 to 1,750. It it was always a thrill to watch a gang of EMD's move out of Auburn climbing eastbound through Covington with the engineer standing on the throttles! What a variegated history this unit has experienced! Her magnificent Northern Pacific Railway color scheme was butchered with the Cascade Green when the Great Merger stifled all individuality. She was last sighted as Burlington Northern Santa Fe 972571, an RSPU – rotary snow plow power unit – stripped of cab controls and traction motors, simply slave unit to supply dc to the master snow plow. If you have a postscript to this story, please share it with us! Railroad Stuff: Northern Pacific 7003A, built as General Motors F9A, 1,750 horsepower, September 1954, serial number 19740, NP Class L-1. Became Burlington Northern 812, subsequently retired in December 1981. Converted to RSPU, BNSF 972571.